Now The Details: Media Organizations: Is Firing Troublesome Employees a Trend? Media Organizations: Is Firing Troublesome Employees a Trend? A friend in DC asks the question: Do you think journalism is cleansing itself with this recent spate of firings - Williams, Sanchez, Thomas, the CNN ME bureau chief, Octavia someone? Or are these unrelated? clearly a limit to how much license a media organization will allow its employees. that they need to get back to first principles about serving citizens with respect and proportionality (although one can always hope). I suspect that money is a major factor. The Times recently reported that Glenn Beck's show is losing ratings and advertisers because of his crazy talk. Roger Ailes and Rupert Murdoch may be wondering how far to push this. CNN is also losing viewers possibly because it's trying to be more like Fox. It hasn't found a way to establish a niche in a unique way that recreates its original brand and following. Larry King can't retire too soon. Parker and Spitzer might just work even though part of the attraction is the "euuww" factor. Anderson Cooper's ratings are also down. NPR's ratings on the other hand, keep going up. Some of the stations' recent fundraising drives have been the most successful ever. So will Juan's firing have any impact on NPR's ability to raise money? I doubt it. Station managers, the NPR board and the big machers have always told NPR management that they find NPR journalists on Fox (including correspondent Mara Liasson who is more measured than Juan but still...) to be distasteful and an embarrassment. next time. My guess is that not many people will lament Juan's departure, just the way it was handled. So far, Schiller has not made many (if any) mistakes and the stations love her for how she's prepared to co-operate, compared to the previous regime which increasingly ignored the stations. The big unknown will be how this will play politically. The right always love to use NPR as a piñata, but since NPR takes less than 2% from CPB, there's not a lot of leverage there. The stations are more vulnerable (they take closer to 13% of their funding from CPB) and a Republican Congress might relish taking on public radio. They tried and failed under Gingrich in 1994, but these days, with the Palin-led pitchfork and torches brigade, all bets are off. The fallout here could be disastrous in a roundabout way. My concern is the lost opportunity cost. I believe (perhaps wishfully) that there was an opportunity building for *increased* CPB-funding. This was appearing on many fronts -- out of legitimate concern for the health of journalism in the U.S. Now, I fear, this hope may be nullified by the politicization of the public media conversation. It may have been a slim chance in the first place, but we may never know as this is not the climate in which to test the case. One more thing -- we may rightfully dismiss as weak the leverage that threats of CPB-defunding may have on NPR -- but de-funding could hurt stations significantly. Not the largest (financially stable) ones, but those in medium-to-small markets where the shares of CPB funding rise in percentage. Oh my. How do you find it acceptable to use the sentence 'Palin-led pitchfork and torches brigade' so soon after you claim that Juan Williams' statement was bigotry. I am not a Palin fan, but I can see your hypocorisy. I guess it is OK to be bigoted about the one distinctly non-violent group, but it is not OK to confess to feeling anxious in the presence of people who belong to a group whose membership includes extremely violent terrorists? Found my way here after being disappointed with Alicia Shepard's post on NPR's site regarding the firing of Juan Williams. It is refreshing to read here such calm and reasonable discourse on this and other topics. As someone who has happily relied almost exclusively on NPR and local newspapers for the past 30 years, I have come to the conclusion that the NPR-friendly community is seriously underestimating the impact of this event on NPR's credibility. I fear not only that the defunding will happen, but that a 'shut up and let the storm pass' mentality is a big part of the problem. CEO: "The blowout preventer failed, and I'm sorry that top kill employing a psychiatrist and publicist was ineffective. But only a few thousand complaints are getting through every day, so containment of the credibility leak is at hand. We will review our procedures to handle this better next time." Duh. Firing troublesome employees. Of course. Any place. Any industry. Any point of view. First you work with them. You explain. You teach. You train. You plead. You show alternatives. You bend over backward. At some point you realize that there is no meeting of the minds. More re Duh: I so rarely fire because I view it as my failure. I failed to hire properly. But, sometimes, it has to happen. Fox is now taking stabs at NPR, the Daily Show did a good segment on that Monday evening. Not suprising, considering Fox seems to harness its resources for its own personal fights on a number of occaisions. 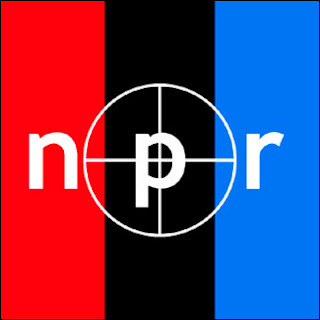 A piece at http://www.americanthinker.com/2010/10/how_public_is_nprs_funding.html argues that when all's said and done, over 25% of NPR's funding is government-based. A big difference from 2%.